The past days have been unusually stimulating for me. The main reason is the annual conference of the Chair in Mennonite Studies at the University of Winnipeg, this year on “Mennonites, Melancholy and Mental Health.” I attended much of it, from Thursday evening to this afternoon, hearing papers on a whole variety of topics connected to mental health – from the history of attitudes, to the history of institutions (like Bethania in Russia, Bethesda in Ontario, Mennonite Youth Farm in Saskatchewan), to personal and family histories, and a lot in between. I enjoyed William Klassen’s account of the early Anabaptist leader Pilgram Marpeck, whose views of the church as a hospital for the mentally ill (offering the healing of forgiveness and joy) contrasted so compassionately with the wider stance of the time, as of a “hammer” upon witches, the “possessed,” heretics, etc. I was moved by Elsie K. Neufeld’s “Madness in my Family’s Journey: Ukraine, Germany and Canada,” with its painful tales of suicide and mental illness, made real but bearable somehow by her poetic rendering of them. Margaret Loewen Reimer unpacked a sensational news story of 1902 in which an Altona teacher, Heinrich J. Toews, shot at several men and then students in his classroom, killing one of the girls. Loewen Reimer noted that while the secular press saw him as an evil man, the Mennonite community viewed him as “possessed.” Elizabeth Krahn is doing some interesting work on how the traumatic experiences of Soviet oppression and flight marked women of the post-World War II migration, and also their now-adult children. She found that the mothers had often had attachment problems, were often not emotionally available. Student Ellen Paulley looked at how mental illness was portrayed in three Mennonite periodicals – MB Herald, Canadian Mennonite, and Mennonite Mirror. Over five decades, the portrayal moved from spiritual categories like unconfessed sin to an increasingly wholistic approach that includes biological and emotional factors. Lucille Marr examined discourse after the suicide of a prominent Brethren in Christ leader’s wife, to show how that denomination enlarged its understanding of mental illness. Here the funeral sermon of the bishop played a key role. He decided to use his spiritual authority to “preach her into heaven.” He’d consulted with her doctor, and stated that the long and deeply depressed woman couldn’t have been responsible for what she did. It’s really not fair to pick out only a few of the conference papers. It’s obvious, for me the “stories” have risen to the surface first. 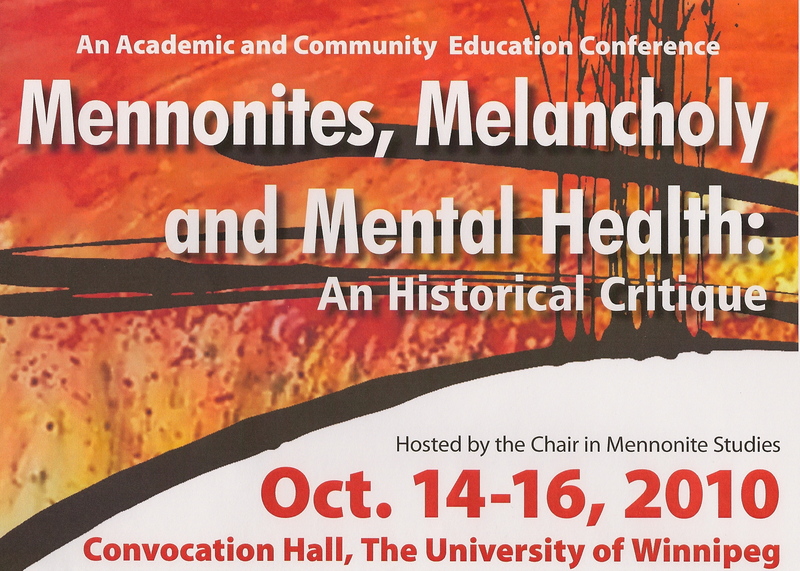 The conference was, as these conferences are, a stew of ideas and sometimes conflicting truths: the compassion of Mennonites for the mentally ill, evident in our history, and the stigmas and difficulties around the same, also evident in our history. And the Marshall McLuhan in the title of this post? Happening at the same time as this conference, there was another one on the university campus – “Marshall McLuhan in a Post Modern World: Is the Medium the Message?” McLuhan was a huge figure in the culture of my generation, and of particular interest to me in my own studies in the area of communication (technology, media) history. So, I simply could not resist skipping out to hear the big name keynote speaker they’d pulled in for that conference: Douglas Coupland. 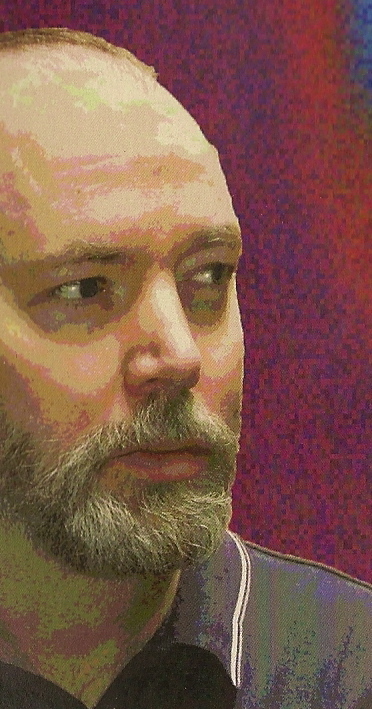 I’m not a big Coupland fan; I’ve read only one of his books – Generation A, which I found brilliantly observant about culture, the cleverness sometimes mystifying, but eventually boring. Still, he’s a kind of phenomenon by now, a guru of culture, upon whom the gift – or at least the expectation – of prophecy rests. Just last week in the Globe and Mail he was offering up his “Radical Pessimist’s Guide to the Next Ten Years,” tips for survival and a glossary of new words we’ll need to know! And, he’s the latest biographer of Marshall McLuhan, in the Extraordinary Canadians series, which is what he’d come to the conference to talk about. We can see famous people like Coupland on TV or the internet, we can read their books to engage their ideas, but there’s still something that draws us to see them in person, to see them unmediated — no media between us. Since McLuhan’s main message, said Coupland, may be that “the body is medium and trumps all else” (going on to describe media as extensions of the body) let me take that literally and describe the physical presence of Coupland in his speech last night to the McLuhan conference at the University of Winnipeg. He looked older than I expected, his (remaining) hair and beard beginning to grey, his shoulders somewhat sloped, his body thickening around the middle. He was wearing black – black pants and shirt and a black windbreaker, but not black as in elegant or particularly bookish. I couldn’t help thinking (maybe because I’d abandoned the Mennonites over at the conference on mental health) that he looked Mennonite. Not one of those Mennonites in professional dress giving a paper, but one you might see at the gas station in, say, Altona, filling up the truck, spits in his pocket. He was born in December 1961, he’s coming 49, so — of course — he looks nearly 49. He puts on glasses to read. But I guess because of his vividness about the new, the way he sees and hears and remembers everything in our culture, all its quirks and whether they’re important or maybe just funny (like putting a toonie into one of our Winnipeg street parking box meters and getting the message “Change is possible”), I’d expected him to be more flamboyant, less paunchy. He had a pleasant, rather gentle voice, his speaking not fluid but proceeding as if in paragraphs, as conversations do. His tongue-over-front-teeth tic seemed to increase as he went on. He said a lot about McLuhan but would often insert information about himself or make some observation about how he was feeling in the moment (“I feel weird up here… like an art object” or, later, “I’ve rambled… [this is] the most random thing I’ve ever done.”) I’m not sure if that’s just how he is or if he’s constructed a persona intended to embody the self-referential style of so much contemporary media (including blogs). In the “exactly” 12-minute question period, I was impressed by how well, how genuinely, he seemed to listen and engage with people in the audience who posed ideas or questions. Altogether he seemed a rather ordinary, exceedingly smart, self-conscious but not arrogant, aging guy. I haven’t said anything of what he said about McLuhan, and the biography project, which was also interesting. Maybe in a subsequent post. This entry was posted in Books, History, Media, Mennonite and tagged Douglas Coupland, Elizabeth Krahn, Ellen Paulley, Elsie K. Neufeld, Generation A, Lucille Marr, Margaret Loewen Reimer, Marshall McLuhan, Mennonites Melancholy and Mental Health, mental health, William Klassen by doradueck. Bookmark the permalink. Melancholy is a very important thing for me because my family back to my grandfather and including myself have been affected by it. The Selbstshutz in Russia (did I spell that right?) did incredible damage. I’m an Abe Lincoln fan and recently read Lincoln’s Melancholy by Joshua Wolf Shenk which gave me lots of insights on how people dealt with it without pills. Erika is active relating to international students at the University of the Fraser Valley where a Chair in Mennonite Studies is in the works. She says Rudy Wiebe is coming soon so I hope to go to that. I recently read Under the Still Standing Sun. It was great. I’m looking forward to getting your new book soon.